This morning we awoke to light rain. We enjoyed a leisurely breakfast and then took a brisk walk around town. 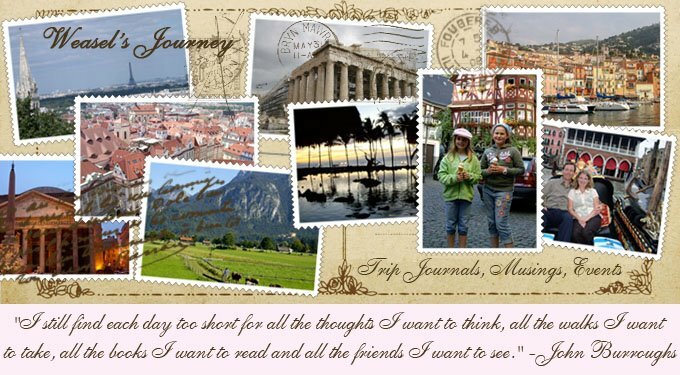 I spent the day writing postcards, uploading pictures and working on my trip journal and reading. 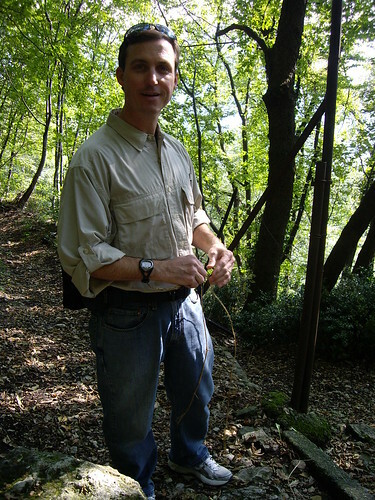 Robert read for a while then left to have a panini sandwich at Caffé Vecchio Borga. 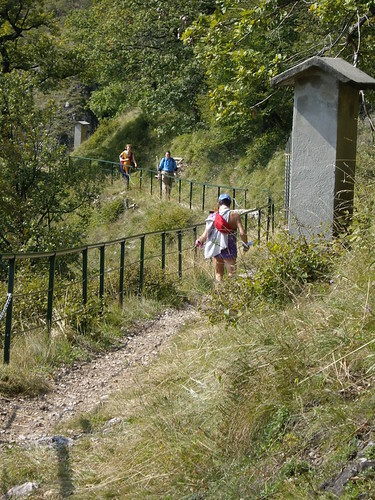 In the afternoon we wandered over to the Internet Point for a glass of wine and hors d’oeuvres. We ended up staying there for a while, enjoying a nice visit with the owner and other travelers in the bar area, and we ate enough of their delicious antipasto spread to count it as dinner. 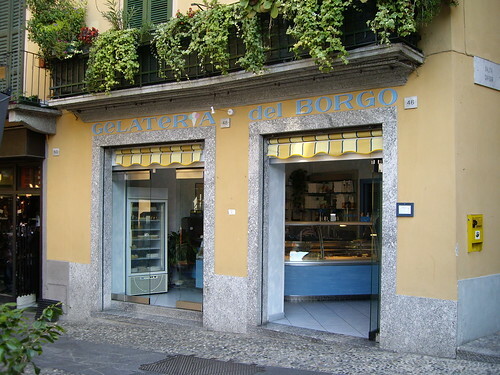 Stopping back at our favorite gelato shop, we bought scoops of cinnamon and pistachio gelato. 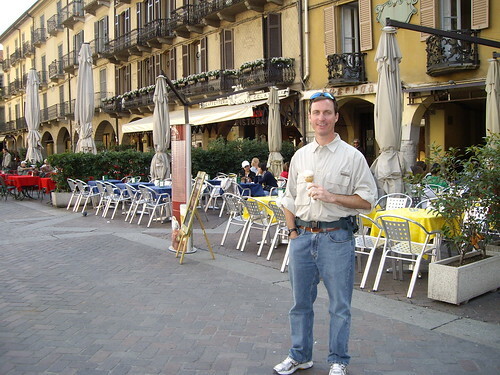 Robert took me on a long walk to the Lago di Lecco side of Bellagio, where he had been yesterday. 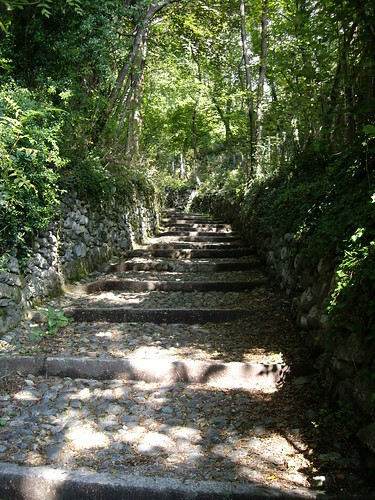 The night was very dark, but the cobbled and walled path was well lit. This little area was very quiet and charming with a much more local feel and a lovely harbor. Our last full day in Italy! We ate another wonderful breakfast in the Hotel Central sunroom. My standard by now was a croissant with strawberry jam, yogurt and either tea or caffé latte (espresso with a LOT of steamed milk). Boy, do I love the yogurt in Europe; it seems so much tangier than what I can buy in the States. 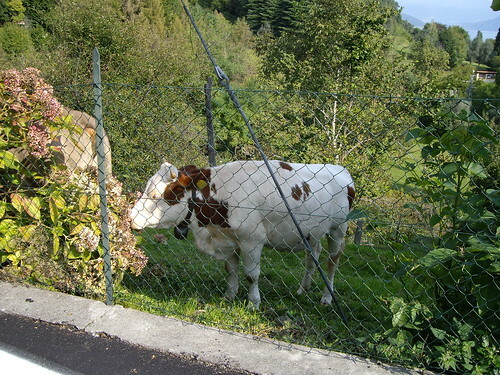 Robert usually had granola with milk, some meat or cheese and a caffé latte. 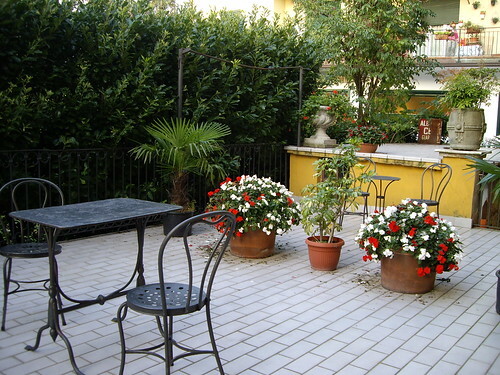 We always enjoyed comparing touring notes over breakfast with other guests staying at the Hotel Centrale, usually our friends from Maryland and the three other couples traveling with them. We took some extra rolls from breakfast and stopped at Gilardoni Alimentari for some more of their delicious fresh pesto, a Coke and a bottle of water. 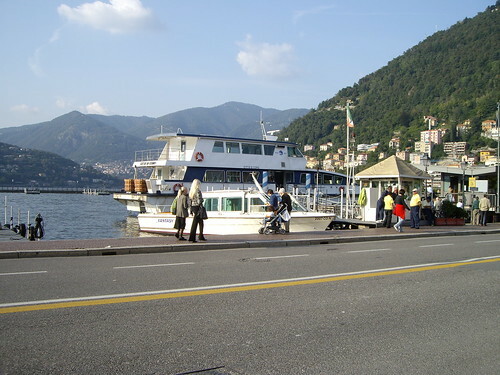 Then we boarded the 10:30 ferry to Cadenabbia, just across the lake from Bellagio, near Villa Carlotta. 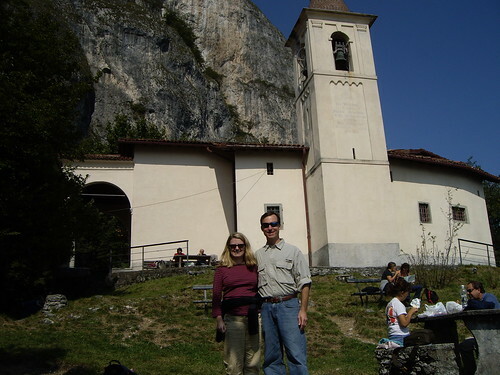 We had seen a church perched high above the lake and had learned from a couple we met at dinner that there was a nice walking trail that led to it. 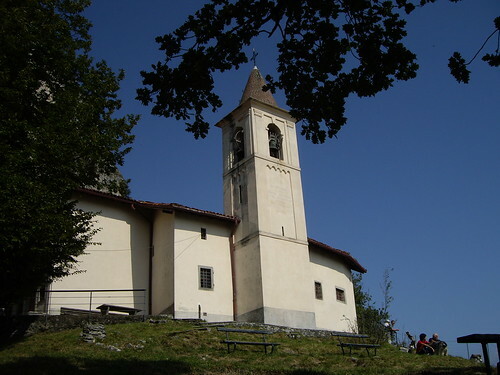 After disembarking in Cadenabbia, we saw signs pointing the way to Chiesa di San Martino. 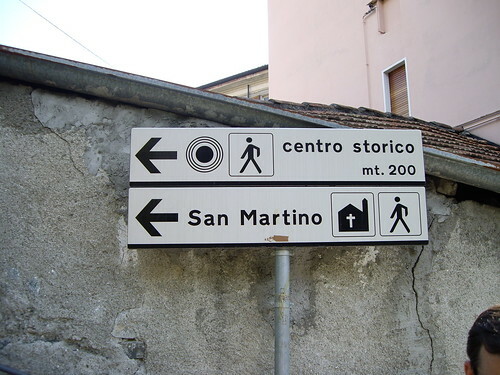 We followed the arrows up little alleyways, and just a few blocks from the lake, we began to have a sense of being far away from the bustling crowds of tourists. 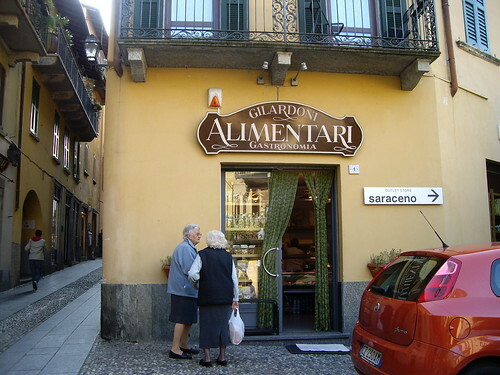 Wandering down the little cobbled walkways of the town of Griante, we passed very few others until we came upon a truck selling cheeses, where some locals were crowded around its counter purchasing their selections. 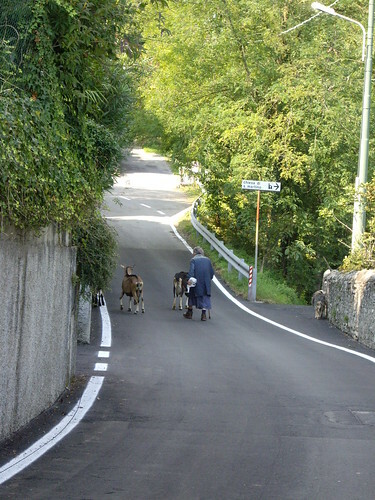 Soon we entered a more rural area with some cows grazing in a fenced hillside meadow, and we encountered a wizened Italian woman fussing and gesturing with her cane at a herd of goats and a dog she was leading down the path (only the dog seemed to be remotely listening to her). I began to get warm and was wishing I’d brought something to pull my hair back. Robert stopped and pulled off several pieces of vine and braided them together into something for me to use as a ponytail holder. I was so impressed! The Eagle Scout skills came in handy yet again. 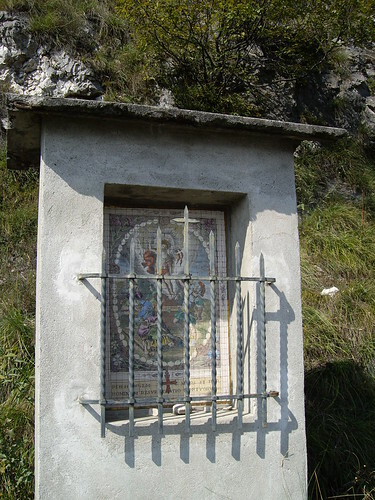 About two-thirds of the way up, we came to a small chapel that seemed to be a memorial to area soldiers who had died in World War I and II. This was a nice place to stop for a minute and admire the view. 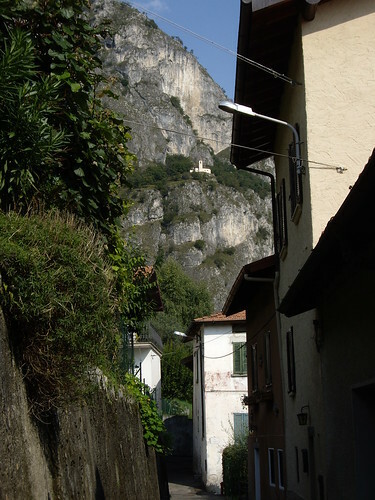 After we'd been on the trail for slightly more than an hour, the Chiesa di San Martino came into view. 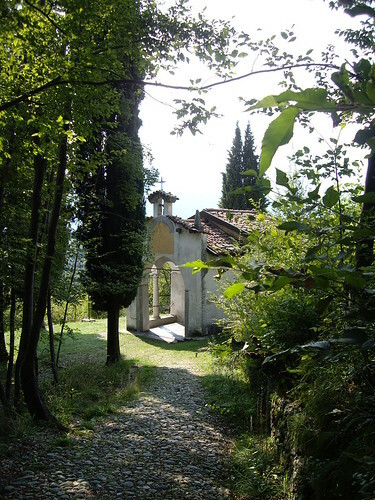 We opened a small iron gate to the church grounds and then climbed up to the church itself. 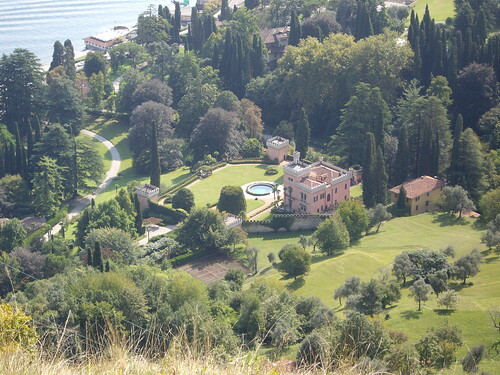 The building was much smaller than it appeared from the lake. We were disappointed that we were not able to go inside, but we could look through a tiny window and see that the interior was rustic but pretty. We staked out a spot on the hill for our picnic and sat down to enjoy our pesto and bread. The view was spectacular! Another couple offered to take our picture, and we ended up hiking back down with them. They were from Des Moines, but he was born, raised and educated in Texas. 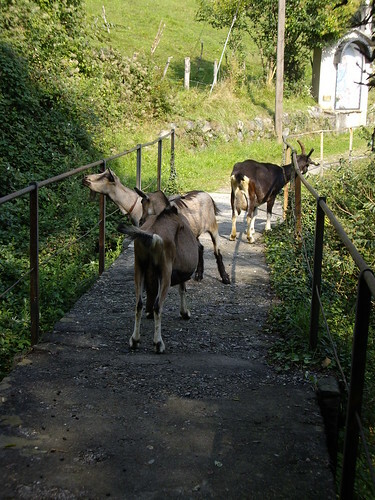 We had a lovely visit with them, and the walk back to the lake passed very quickly. 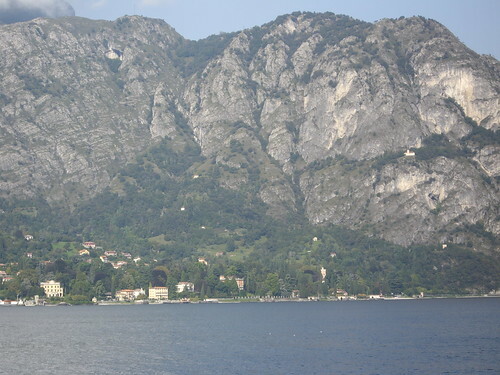 Arriving back in Cadenabbia, we decided to walk to the neighboring town of Tremezzo and catch the hydrofoil (“rapido”) to the town of Como at the far south end of the lake. At the dock we ran into the three couples traveling with our Maryland friends and had a nice conversation with them while we all awaited our boats. The ride down to Como was beautiful. 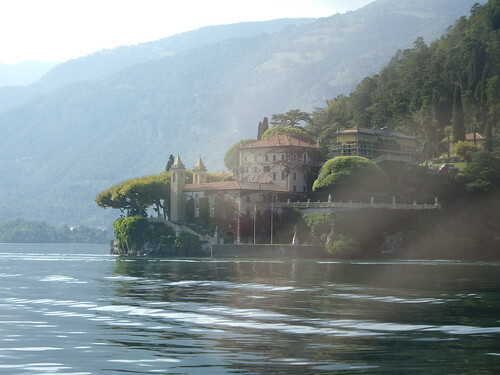 I especially liked seeing Villa Balbianello from the lake. 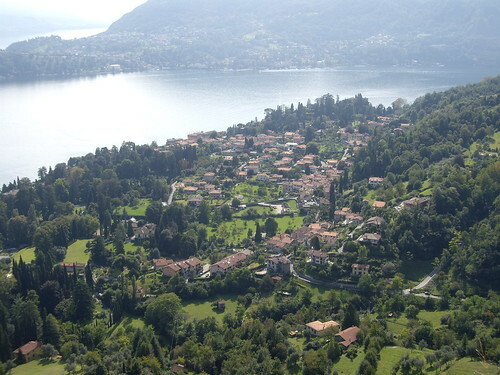 Lake Como became more populated and congested as we approached the town of Como. We got off the boat and walked around Como for just about a half an hour. 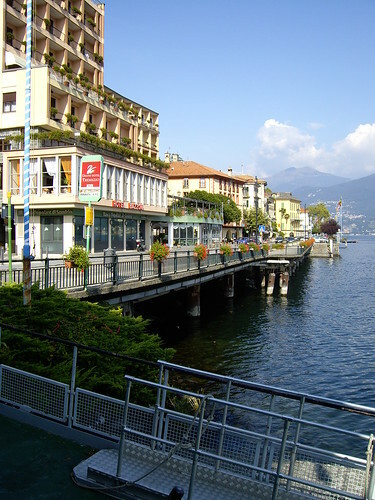 Como was much larger than any of the other towns on the lake and had a definite urban feel. 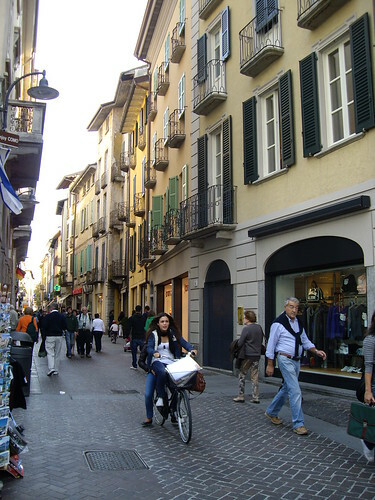 There was a nice pedestrian-only area with some upscale shops and a large duomo (church), but I much preferred the smaller, quainter towns. 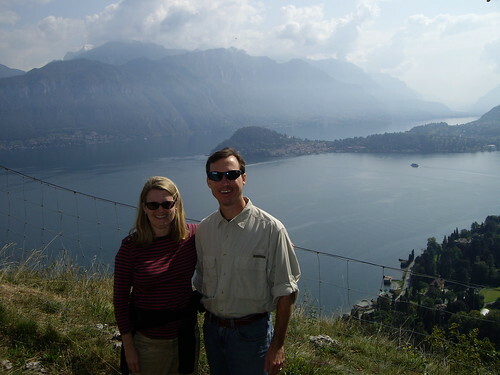 We climbed back aboard the “rapido” boat and returned to Bellagio. Upon returning to the Hotel Centrale, we stopped to talk to Giacomo, the owner, about our impending departure in the morning. He kindly looked up the hydrofoil and train schedules and made arrangements for his son, Marcelo, to bring breakfast to our room that night since we would be leaving before the appointed breakfast hour of 8:30. We had dinner at a restaurant called Baba Yaga that we had seen while walking to Punto Spartivento. We were pleasantly surprised to find two parties from our hotel sitting on either side of us: a young couple from Australia on a five-week holiday in Europe and two of the couples traveling with our Maryland friends. 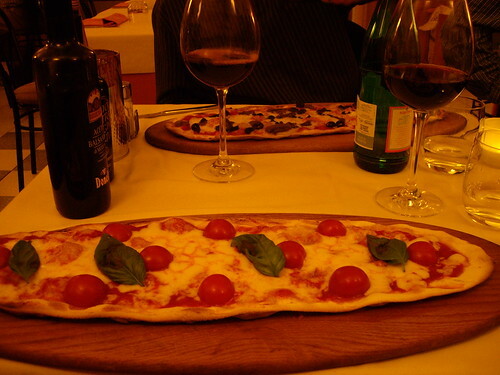 Our dinner was salad and pizzas and some local wine. It was delicious. We had wonderful conversations with those sitting around us, finding even more than a mutual love of travel to connect all of us. 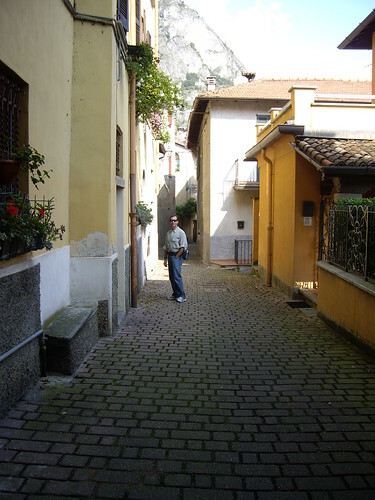 One of my favorite things about Bellagio was all of the nice people we met who were also visiting there. 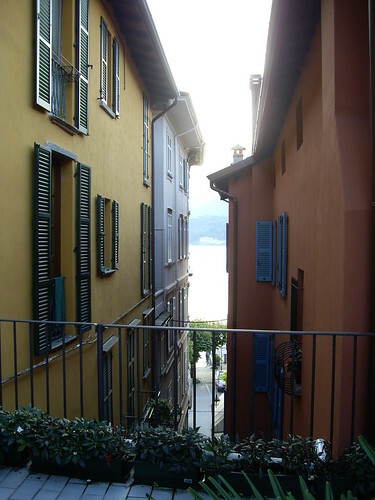 We returned to our room quite content with our meal and our time at Lake Como and turned our thoughts to packing for home. 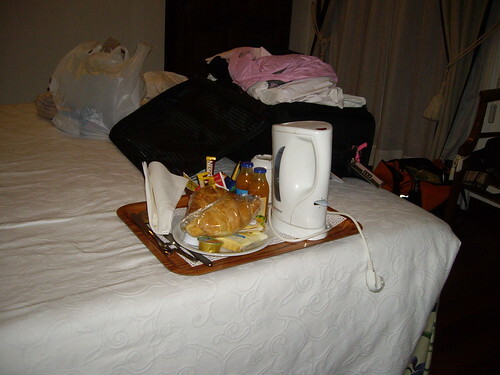 We found a wonderful tray of breakfast foods and a tiny coffee maker on our bed. We awoke early so that we could catch the 6:45 rapido to Como. There were a few other early bird travelers on our boat, but the majority of its passengers were high school students from around the lake heading to class (I learned that most of the towns on the lake had an elementary school, but the only high school was in the town of Como). They were a lively group, and it was fun to watch how they had different sections of the boat staked out; most of the kids headed straight for a particular area as soon as they boarded. Arriving in Como around 7:30, we hurried to the train station (about a ten-minute walk) to catch a 7:47 train for Malpensa. We changed trains in Saronno and arrived at the airport at 9:07. Our flight was at 10:35, but fortunately we did not encounter any long lines at check-in or security and had plenty of time before our departure. We flew from Milan to JFK, had a four-hour layover there where I had some of the worst nachos ever created (lesson learned: don’t satisfy cravings for Mexican food until back in Texas), and then arrived back in Dallas around 9:30. By the time we got home we’d been traveling 23 hours! All well worth it, though, for the privilege of visiting such beautiful places and the joy of seeing our children again. What a great set of trip reports you have created. If I did not KNOW that you are 20 years younger than I am, these reports would verify that fact. Just reading them made me reach for the BenGay! 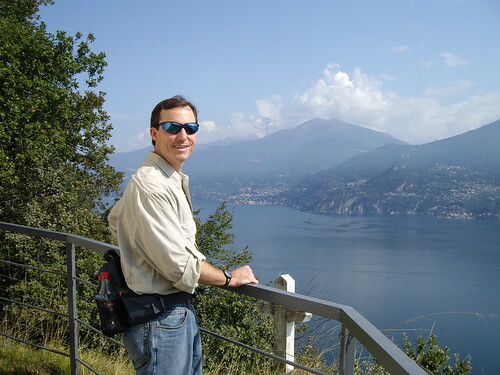 I had recorded a recent show of Rick Steves's and watched it last week...he was in Varenna!! Imagine that. Eloise, lovely trip report. I'll confess, the Lakes haven't pulled me in yet for a visit--but your photos may have changed that for aa future trip someday.